OR READ ABOUT OUR STORY HERE. Lauren and I met in our very first photo class in college. My first impression was that I was going to hate her. She asked for my help with a roll of film and we started talking. By the end of the day, I just knew we were going to be friends. A here through thick and thin - kind of friend. A backpacking through Europe, roommate, bestie, wingman, confidant, maid of honor at her wedding - kind of friend. A forever - kind of friend. Almost four years ago I was diagnosed with breast cancer. As a 26-year old this was obviously something I never saw coming. Or ever could've imagined would happen to me. I remember sitting in that room hearing those words…we found some cancer…and feeling almost paralyzed. As odd as it sounds…I wanted to laugh. Hard. How in the world could this be happening to me?!?!? I’m young. I’m healthy. I don’t have time for cancer. Just when I thought it couldn't get any worse...I got more bad news. Chemo. This one hit me the hardest. So your best friend has breast cancer. I'm sure you can imagine all the thoughts and fears that would consume my mind... so I'll skip that part. Lauren was going to have to go through chemo. She forbade me from shaving my head... but I had to do SOMETHING. I bought my very first lottery ticket so that I could win and pay all her medical bills. In case that didn't pan out (it didn't)...I just needed to DO something. Lauren and I agreed some years ago, that if we were ever stumped on birthday gifts, we would both like to receive coffee table books... and SHOES! We have always shared a love for shoes, and always lamented that we don't wear the same size. It wasn't her birthday, and there wasn't a reason to celebrate per se... but a gift seemed appropriate. The morning of Lauren's first chemo treatment, I packed a bag with snacks, games, magazines and gifts. (Lauren LOVES surprises and receiving gifts. I L - O - V - E giving the perfect gift, and this time I had it). After she checked in and and the doctors prepped her, I unpacked the gifts. When I saw the look on her face as she opened that box... I knew I had nailed it. I'll never forget my first day of chemo. I was terrified out of my mind but tried to not let it show. My now husband and best friends came with me to try to take the edge off which is something I will always be grateful for. As we settled into our corner with bags upon bags of games and snacks and all things happy...I was ready to get started. I had worked this up so much in my head that I was sure the chemo drugs were going to feel like acid in my veins. As the first medicine started...Sidne, pulled out a box. I immediately got a huge smile on my face because who knew you got presents for starting chemo?! As I made my way through the wrapping paper and opened the box, I had to laugh out loud at what I saw. High heels. And not just any high heels. Five inch, bright blue, glittery, spike covered stilettos that couldn't have been more perfect. As I held the shoes up for everyone to see...Sid went on to explain that they were my chemo shoes. Because in those shoes I was going to kick cancer where it hurts. And that's exactly what I did. I wore them to every single treatment...without fail. And over time a funny thing started to happen. I actually started to look forward to when I got to wear those shoes. When I thought about chemo I didn't think of sickness and meds and my disease...I thought about those shoes. And in the middle of something very dark and depressing...they gave me a reason to smile. And more importantly...they gave me hope. Several years later, Sidne and I knew those shoes had a bigger story to tell. 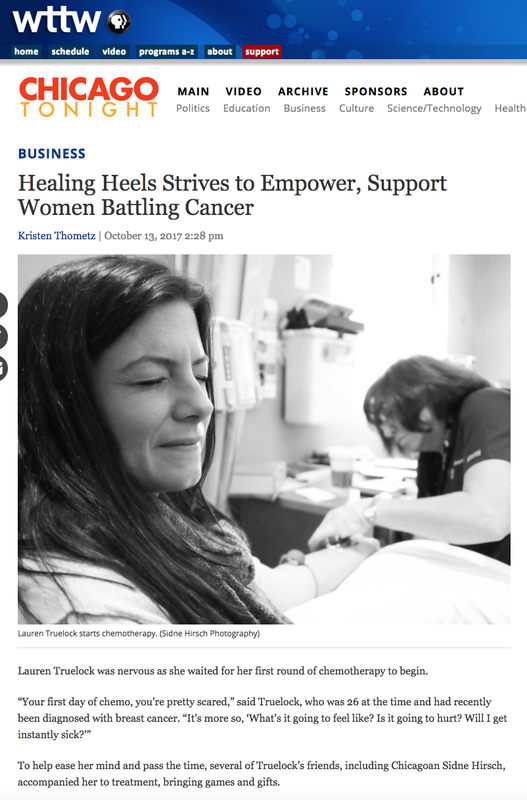 So we started Healing Heels...a Line of fierce, edgy shoes that give back to cancer patients. We have seen first hand the power these shoes posess and we want to line the soles of courageous cancer fighters everywhere! And to anyone who says a pair of shoes can't change the world...think again. Because they sure changed mine. To line the soles of every woman fighting cancer. See what Healing Heels has been up to!